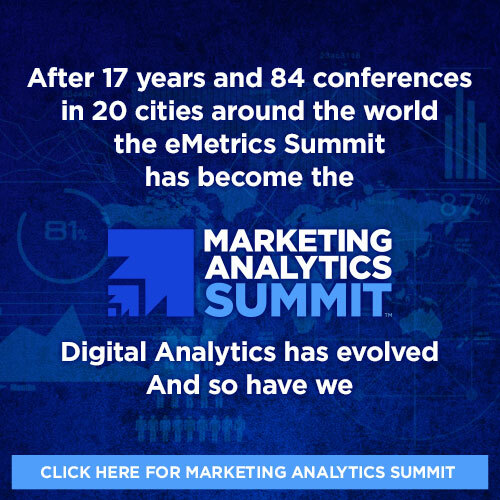 Since 2002, the eMetrics Summit has provided marketing professionals with practical, tactical insights on using data to optimize marketing. The eMetrics Summit is a diverse community of online marketing professionals, sharing unique ways to glean and apply marketing insight from data. I ask my speakers to focus on the day-to-day, get-‘er-done tasks that marketing people need to know about – rather than pontificating about how marvelous the future is and how we’re all going to be data scientists and machine learning AI’s will cook our breakfast and brush our teeth. I had such a great time. I enjoyed the content and was able to learn something new, get good tips, and make a new connection from each session. It’s great to come together with other professionals in one space and talk about all the challenges we face with analytics and data collection. eMetrics did a great job of facilitating this! eMetrics demonstrated the near term actionable future. Those who do not rise to the responsibility of owning their own DNA will flounder both personally and professionally. Thanks for a great couple of (eMetrics) days, listened to and participated in some great conversations and as a bonus took some things away that I’ll be putting into the day job. I attended my first eMetrics early in my analytics career, back when the industry big-shots were just normal guys, and we all fit into one room for dinner. I can’t think of a better way for a new analyst to launch a productive and effective career. Now, as an established industry professional responsible for developing a large global team, I still attend eMetrics, sometimes in more than one country a year, but this time to identify and foster high-level partnerships between organizations that can launch productive and effective collaborations. Finding young talent who might help take my team to the next level is an extra bonus.